The tagged redfish was one of five released in Lake Sabine on May 25, 2018, as part of the Coastal Conservation Association of Texas' 29th Annual State of Texas Anglers' Rodeo, also known as the STAR fishing tournament. PORT ARTHUR — A teen fisherman from Southeast Texas likely has a great story to tell after catching a tagged redfish that could have won him a truck and boat combo. 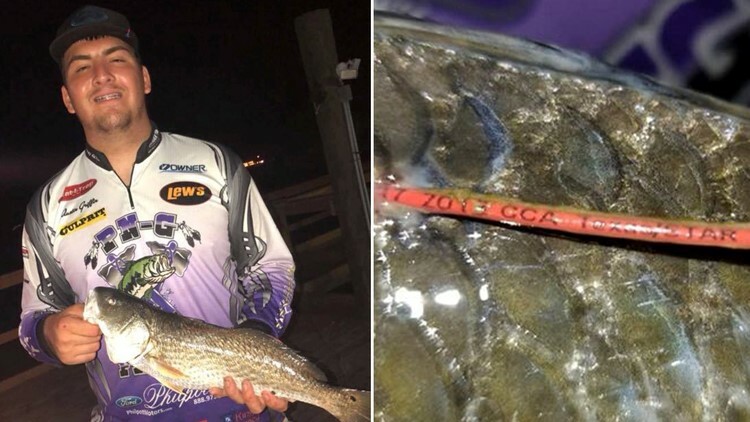 Port Neches-Groves High school senior, Austin Griffin, 17, told 12News he caught the tagged redfish using "Gulp Bait" at about 10:20 p.m. Saturday night while fishing from a private pier on Pleasure Island with his girlfriend and his uncle. Once he and his uncle got the fish onto the deck of the pier he noticed the tag and realized that he could have won a new truck and boat had he been registered for the tournament. Within five minutes of releasing the fish Griffin, still standing on the pier, used his phone to register for the tournament. Griffin told 12News he then immediately began trying to catch the fish again and only stopped when he got tired at about 1 a.m. He was back at it at 8 a.m. Sunday but hasn't caught the fish yet he told 12News when reached at work on Monday. Griffin, who is a member of the PN-G fishing team, says he is confident he can re-catch the fish and is willing to fish for him daily through the end of the contest on at 5 p.m. on Labor Day. The tournament, which lasts more than 100 days, has been running since Saturday, March 26, 2018, and will end at 5 p.m. on Labor Day, September 3, 2018. The CCA released 60 tagged redfish along the 600 mile Texas Gulf Coast from Sabine Lake to South Padre Island and the first five tagged fish caught will net the winner a 2018 Ford F-150 "Texas Edition," a 23' Haynie BigFoot boat rigged with a Mercury 150L Pro XS OptiMax motor and a Coastline trailer. The next five tagged fish will earn lucky fishermen a 23' Haynie BigFoot boat with a Mercury 150L Pro XS OptiMax motor and Coastline trailer. Two Southeast Texas fishermen won a truck, boat and trailer last year with fish caught along the upper gulf coast according to Kinney.